It was a long trip from SFO to Fumel, but we made it! The flight from SFO to CDG was great, and most of us were able to get some sleep. Some of the children were so excited that they had trouble sleeping. While we waited in Charles de Gaulle airport for our flight to Toulouse, we had time to explore the duty free shops. A few of the children found some fun souvenirs to bring home. By the time we boarded our second flight, everyone was exhausted, and we didn't hear a single peep during the hour and a half flight. Everyone was fast asleep. This made for an interesting journey from the plane to the baggage carrousel and eventually to our bus because several of the children were sleeping standing up. Our bags arrived quickly, and our bus was waiting for us. Once we got on the bus, the kids were so excited to meet their host families that the bus was alive with excited chatter. We arrived in Fumel just after 10pm to our host families anxiously awaiting our arrival. They were waiting and waving on the curb as we pulled up. We went in the school briefly to introduce everyone and then went home to get some much needed rest. Today the children spent the day with their host families. 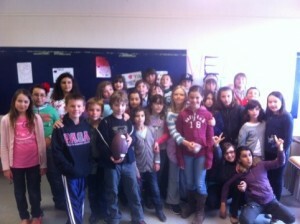 We met for a reception at L'Ecole Jean Jaurès in Fumel at 5pm. All of the children and host families have already formed a bond. Most of our children slept late and then spent the day playing with their host "siblings." It was fun to see all of them running around, playing together, and speaking French at school. With several of them, it seemed like they had known each other forever. The children have gone home to enjoy the rest of the day with their families and get more rest for our ropes course adventure tomorrow.